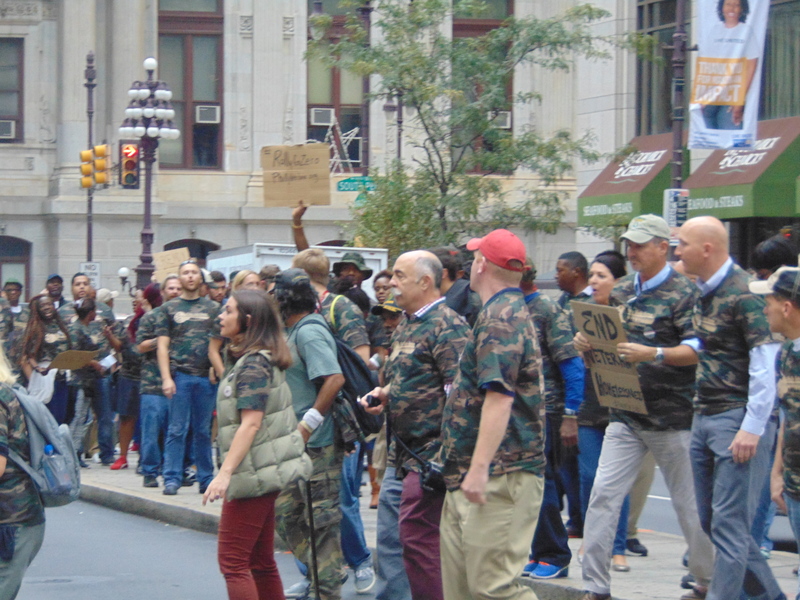 Veterans March on Broad St. to End Homeless Vets. Jim Smith/El Hispano – According to the Department of Veterans Affairs and Housing and Urban Development, nearly one-in-five of the homeless men we pass daily on park benches or huddling together on the Parkway and our streets are Veterans. Although the vast majority of homeless vets are of Iraq and Afghanistan, some are Vietnam era (6.3% live below poverty rate). The homeless veterans span every demographic: 93 percent are male; 49% are white; 34% are African American; 11% are Latino; and 45% are ages 31-50. 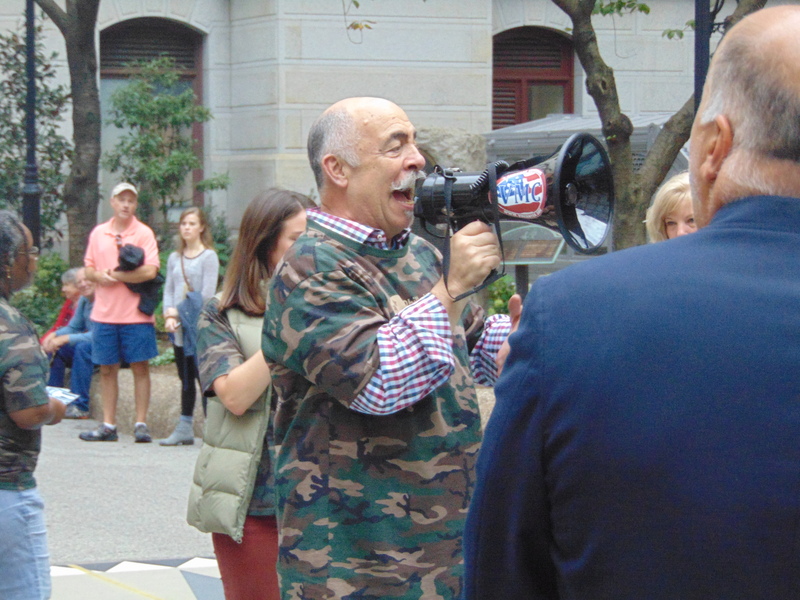 Donning camouflage t-shirts, more than two hundred veterans, vet advocates and housing officials joined WMGK DJ John DeBella, Friday, at a LOVE Park rally highlighting the city’s progress in ending homelessness among local vets. 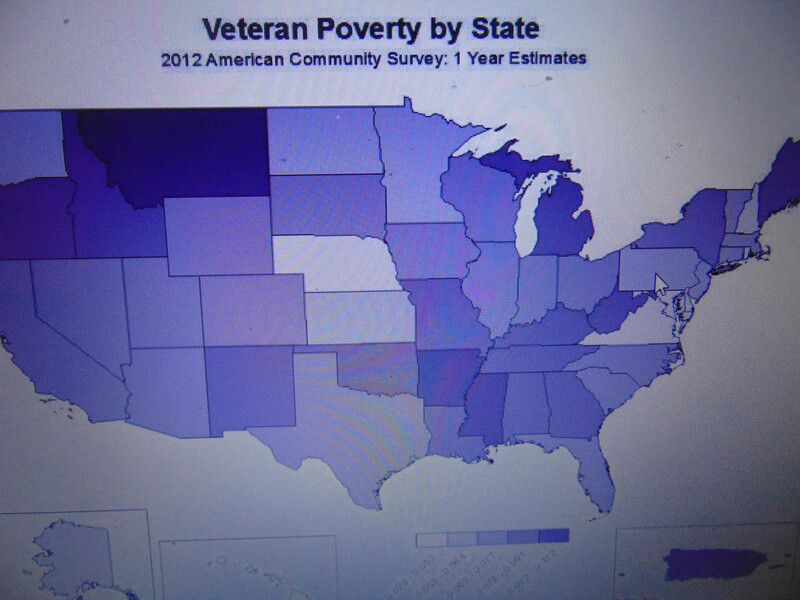 A maps state-by-state where vets most homeless. Pennsylvania and New Jersey have fewer homeless vets. Since 2010, the number of homeless veterans in the U.S. has declined 33 percent, from 74,770 to 49, 930. In Philadelphia, the effort to end homelessness among vets has reached what the Philly Vets Home.org described as an “unprecedented” level of success. WMGK DJ John DeBella calls attention to fight to end Homeless Vets. With collaboration between the Nutter administration, the regional office of HUD, the Veterans Multi-Service Center, VA Medical Center and others, more the 1,200 Philadelphia-area veterans have obtained permanent housing in the last two years; a 90 percent decrease in the number of unsheltered local veterans. The ‘Mayors Challenge’ initiative, spearheaded by First Lady Michelle Obama, entailed a collaborative effort to provide permanent housing to veterans which has garnered the support of 210 mayors and county officials across the country. “It’s not always about money,” said Jane Vincent, Regional Administrator of HUD. “The Department of Veterans Affairs and our federal and local partners should be proud of the gains made reducing veterans’ homelessness,” said Secretary of Veterans Affairs Robert McDonald. Deb Derricks of VMC organized the event.